Mixing my favorite two hobbies! I think this would be really cool. I think I would even try to make the 3d printed parts from some really stiff cardboard. Maybe laminate them with some inner support structures. Not sure, but I sure am going to try it and see! Anyone else here interested in electronics? Arduinos and such? If you do build it (and that would be awesome), please post a detailed build thread and tutorial. 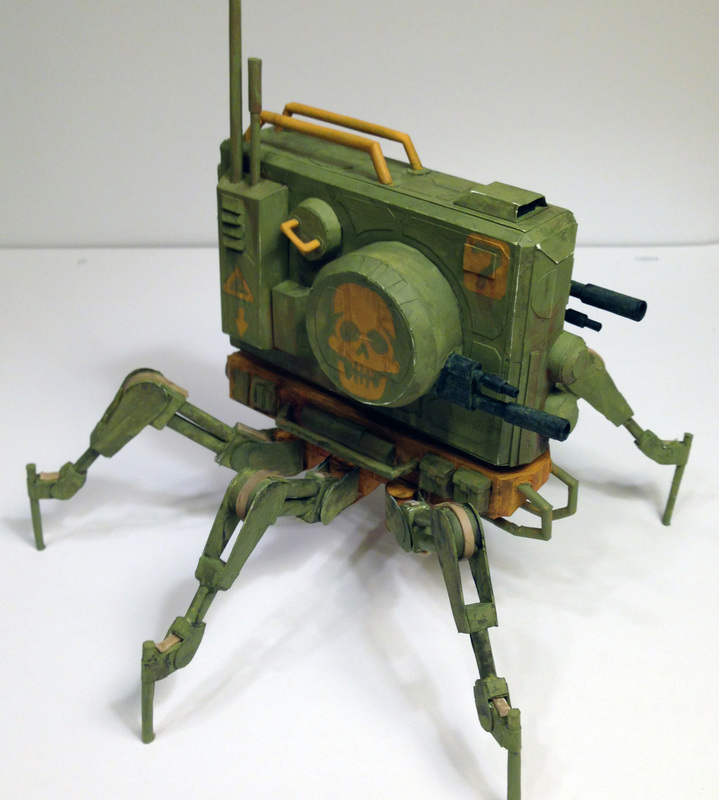 I think this would be a less ambitious, yet good stepping stone to a full on hex with a complex Tank Bot body on top. Well, the walking robot was a bust. Those cardboard pulleys and rubber band belts just couldn't overcome the friction of the leg pieces and the cranks...maybe my dc motor was too weak. I don't know, it was just a mess. I finally got around to giving the motorized tankbot a shot. I decided to make it a quadruped instead of a hexapod to cut down on complexity, cost, and trying to use the electronics I have on hand. Over the last few weeks, just a bit at a time, I have slowly cobbled together a quadruped frame from craft wood sticks I purchased from Walmart. I went through a couple of prototypes before settling on a simple design. I did the design work with Inkscape, then exported g code and plotted the templates for the leg pieces on my plotter. I made them simple for easier wood cutting, but I will add detail with cardboard and paper. at least that's the plan. The Wright Bros, Thomas Edison, Robert Oppenheimer and countless other experimentalists and scientists had similar problems. It is a refreshing thing to watch you fail, pick yourself up and try again. Kudos to you! Looking forward to seeing whatever you create! Awesome thread! Will be interesting to watch your progress. Thanks, this will be a lot of trial an error. Although I'm fascinated with little electronic devices, I think I am more interested in the result of motion and life in my creations. I think I rubbed a few people the wrong way then burned some bridges to top it off over at the Arduino forums. So you might see quite a bit of failure in this thread! Will follow this. Saw a review on TV of a paper plane with camera and electronic control surfaces and it looked pretty good so I will be looking at this new field with interest.